Black Tap Craft Burgers & Beer — the award-winning burger joint in New York City — will open its first California location in Disneyland’s Downtown Disney District in 2018! Black Tap will bring their well-known All-American and Vegan Burgers to the new location, along with their signature CrazyShake™ milkshakes, like The Cotton Candy Shake (Strawberry) and The Bam Bam Shake (the “Fruity Pebbles” Shake). 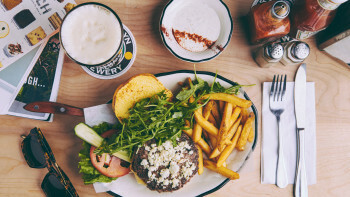 Type of Food: Burgers and beer! Not yet available, but it’s all in the name: burgers and beer! Look for All-American and Vegan Burgers, along with Black Tap’s signature CrazyShake™ milkshakes. Look for Black Tap Craft Burgers & Beer to open later in 2018. You’ll find the upcoming location, which will feature indoor and outdoor seating, across from Catal Restaurant and Uva Bar when it opens.